For lovers of Tranquility, this beautiful two-story waterfront home with 2 bedrooms and 2 baths offers a peaceful retreat for guests to sit on the spacious deck and watch the wildlife on the water. Otters, seals, bald eagles and a variety of birds can be seen from the expansive windows facing the Strait and a telescope allows for seeing the marine traffic up close. Occasionally you can even catch glimpses of the Orcas playing in the Strait. The lovely first floor has many windows facing the water that flood the rooms with natural light and allow for you not to miss a thing that happens. The open concept living/dining area has comfortable contemporary furnishings, a fireplace and a dining set for 6. A fully equipped kitchen is ready for you to whip up a meal or light snack. After your day's adventure, retire into the media room and watch a favorite movie. The downstairs bedroom has a comfortable Tempurpedic queen size mattress and extra guests can stretch out on the sleeper sofa in the living/media room. The second floor offers an elegant master bedroom with a balcony overlooking the beach and en suite bath featuring a large soaking tub and separate shower. You will sleep peacefully in the very comfortable Sleep number king size bed, a perfect getaway for couples looking for a quiet retreat. Just 20 minutes to downtown Sequim, local gift shops, restaurants and coffee shops. Local adventures in Sequim will have you tour a Lavender farm, hike out to the historic Dungeness Lighthouse, or drive through the Olympic Game Farm and feed all the wildlife. Discover the beauty of the rainforests, rivers, lakes and vistas throughout the Olympic National Park. Take a day trip out to the western beaches with their gorgeous sea stacks, or beach comb at the popular Salt Creek area Crescent beach where tide pools bloom with sea life you can touch and feel. Whether you stay in and enjoy the peaceful view or venture out to explore the area, memories are sure to be made at the Tranquility Beach House. Excellent service start to finish. Thanks for helping and taking our reservation over the phone since we booked within 48 hours of arrival. Tranquility Beach was a perfect house for out little getaway. It's in a quiet and serene location, and perfectly centralized to be able to go and enjoy all that Sequim and other surrounding cities has to offer. Always extremely helpful and knowledgeable and we will continue to use your staff in the future. This spacious, light, home on a quiet strip of beach is as described...only better. Pictures can't adequately convey the expansive view of the water and mountains from virtually every room in the two-story house. The beach is steps away. The outside deck is huge and wraps around the entire front of the home and side. The rooms are well-appointed and the kitchen well-stocked. Beds very comfortable. Driveway accommodated two large vehicles plus a 22' boat trailer. We are eager to return. Beautiful house, beautiful views, such a peaceful place. "Tranquility Beach" house is well named. This place was exactly as advertised - a quite, serene, well-appointed home right on the beach. My mom and I stayed here for a full week, and we had a wonderful time. We spent our days exploring the area, including the wild game park in Sequim, Port Townsend, Port Angeles, whale watching, and visiting Canada on the ferry. Our evenings and mornings were lovely, with several eagle, deer, and otter sightings from the window. I'd recommend this place to anyone looking for a very nice and restful place to finish your day, however you spend it. 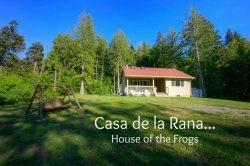 There's a lot to do around Diamond Point in the upper peninsula, so don't be put off by how serene this property is described. Lots of hiking, biking, fishing, and other active opportunities. If we can manage it, we'll definitely be back. The rental agency staff were great to work with, and helpful. Check-in time is 4 PM and Check-out time is 11 AM. Cell service can be spotty in this location.